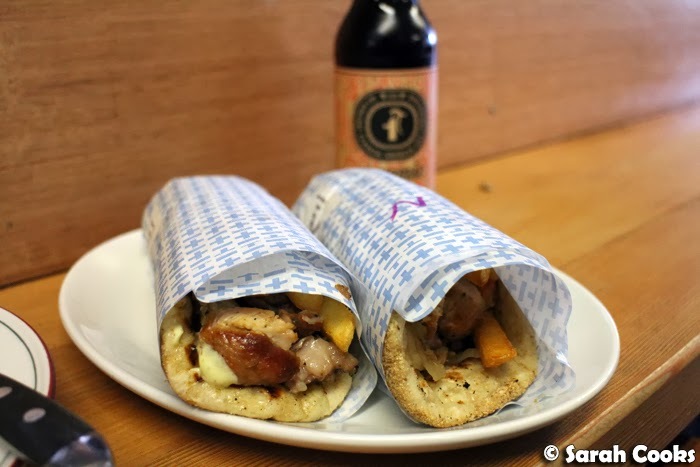 I've got a two-for-one post for you today: Gazi and Jimmy Grants! 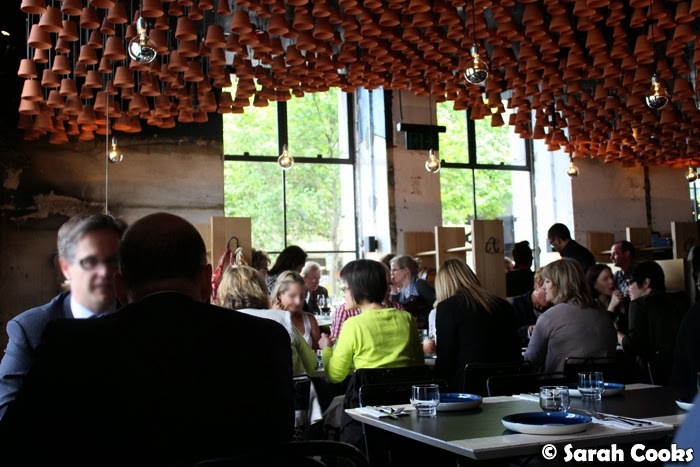 Two relatively new George Calombaris restaurants, both serving traditional Greek street food with a modern twist in a contemporary atmosphere. 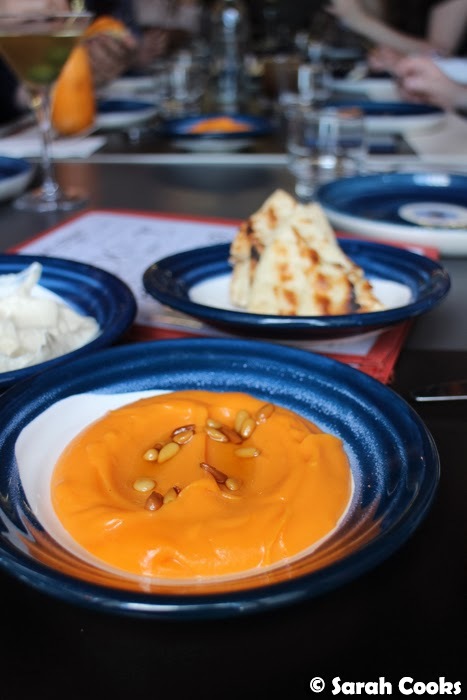 We had a work team Christmas lunch at Gazi (self funded) in mid-December, and it was totally packed! It seems to be a really popular spot for groups. 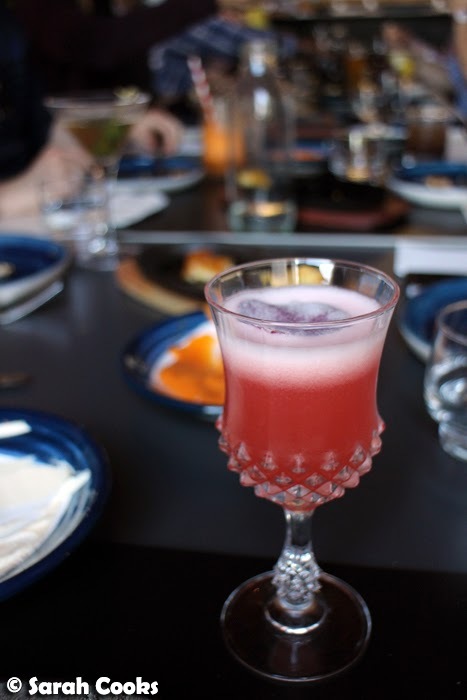 All through December I kept seeing friends on Facebook post pictures from work lunches at Gazi. Good location, famous owner, sharing menus with easy-to-please, tasty food - no wonder it's popular. We had a $49 "Doing it Greek Style" seven dish sharing menu. (N.B. the current menu online has a new 10-dish "Doing it Greek Style" menu for $69 - so best to check with the restaurant to double check what the current offering is). We started with dips and bread. The taramosalata had a really intense fishy flavour and was super smooth - I loved it! A world away from the bland and moussey pink dips you get in the supermarket. I was less impressed by the sweet potato skordalia, finding it a bit sweet and bland compared to the punchy taramosalata. If I were to visit again, I'd probably skip this one and try one of their other dips. The bread that you can (just) see in the above picture was great, warm pieces of fluffy and thick pita. 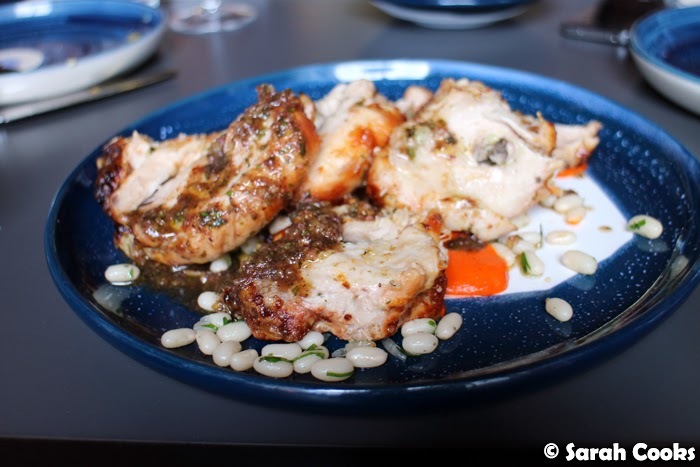 The chicken (done on a woodfire spit) was excellent - super juicy and moist, with a lovely lemony marinade and sauce. 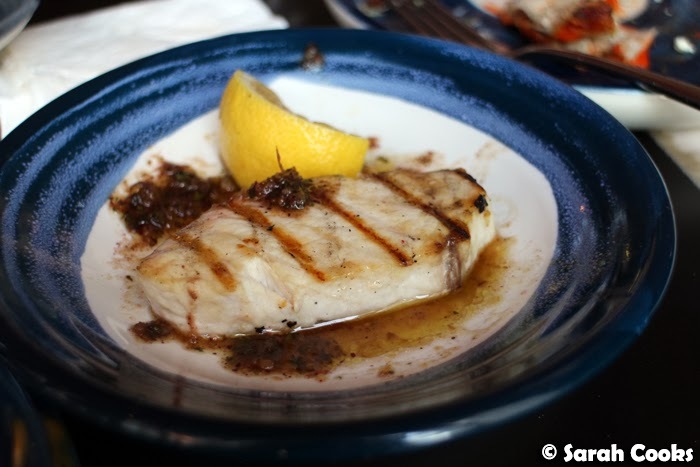 The swordfish wasn't part of the 7-course menu, but was done specially for one person on our table who can't eat meat. (N.B. my teammate who organised the lunch for us had called beforehand to inform them of dietary requirements). He couldn't finish the fish, and passed it around the table for any of us to take. I only took a tiny slice to be polite, but wow - it was totally amazing! So fresh, really soft and with a dee-licious marinade. Yeah, as soon as it had made it around the table, I took the rest of that fish and practically inhaled it. So good! Yup, those chips tasted as good as they looked. Cute wedge salad! 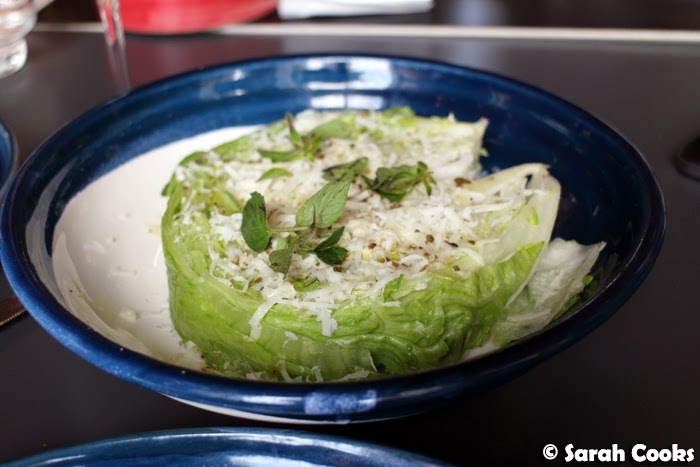 I don't usually eat iceberg lettuce, but its refreshing crunch was welcome against all the other rich dishes. 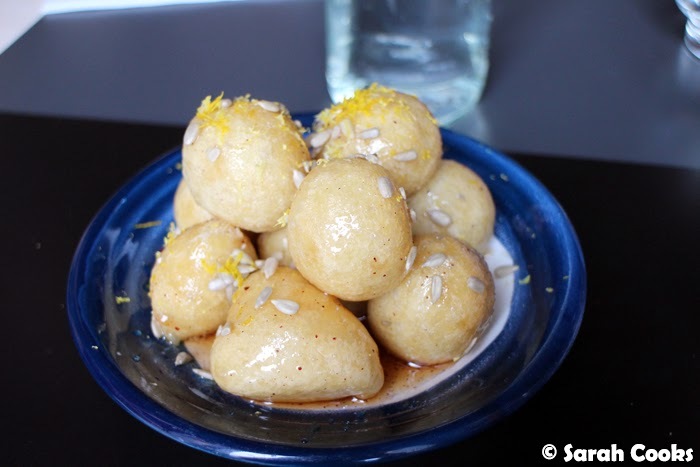 I'm not personally a fan of Greek donuts (give me a sugar-dusted Berliner any day), but these were done well, and the lemon zest and sumac stopped them from being overpoweringly sweet. There ended up being about one donut per person, which was a nice sweet way to finish off the meal. I liked Gazi. Considering the quality of the dishes, I felt $49 was quite fair for the amount of food we got, although I should mention that more than one person on our table felt that there could have been more food for the price. Service was a bit haphazard. When the dishes were being brought out, one of my coworkers asked what we all thought was a simple question: "How many of each dish do we get along the table? I just want to know how we should share them", she was greeted with a blank smile from one waitress who didn't understand even though my coworker asked her twice. When she asked a different waiter, she got an abrupt: "You don't worry about that, I worry about that!" Um, what? Another point to mention - our group had two long tables, and whilst my table's food was all brought out and cleared away pretty promptly, our second table struggled a bit. For example, bread was brought out for them, but nothing else for a good fifteen minutes. And when one of the people on the table asked a waitress: "Will we get our dips? ", the waitress replied: "Well you guys arrived later than your other table, so you'll have to wait". This is all well and good, but why bring the (rapidly cooling) bread out and leave it there then? Having said that, I personally still liked the lunch, and I guess I was lucky that my side of the table didn't have any major issues. In all fairness to the waitstaff, on the day we visited it was totally chockers with big group bookings, the tables in there are tightly packed, and it was really noisy - so I can imagine that it would be really difficult for individual waitstaff to co-ordinate everything. 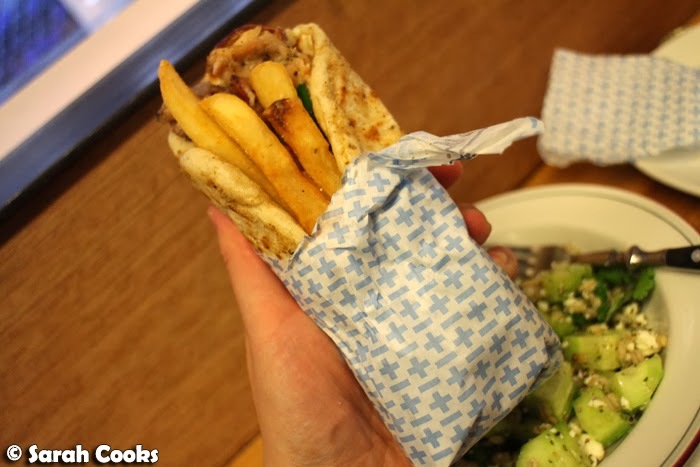 I definitely want to go back to try their souvlakis and other items from their grill, but just in a smaller group, and ideally at a less busy period. 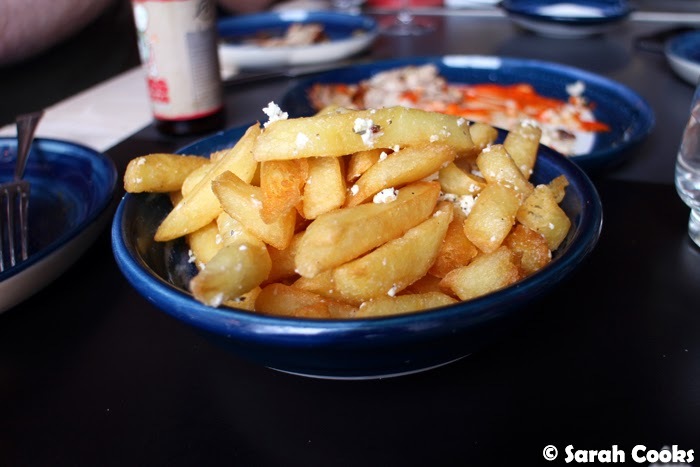 Jimmy Grants is George Calombaris' new-ish casual souvlaki bar in Collingwood - and it's been written about by practically every Melbourne food blogger I follow, so I'll spare you the details and just give you a rundown of our visit. We popped in on a Saturday afternoon for a quick lunch. I have to say I was a bit nervous about visiting a very popular and hyped up restaurant, but despite them being super busy, the service was very good. Hooray! At first we thought the restaurant was full, so we ordered our food (two souvas and a salad) to takeaway. However, after having ordered and paid, we realised there were free seats at the bench facing the kitchen, so we asked the guy at the counter if we could eat in instead - no problem. We sat down, the food was brought out pretty quickly, and there was no issue with them finding us even though the dockets would have said "takeaway". (Thanks to the guy behind the counter for organising this seamlessly! In case anyone wants to give him good feedback or simply say hi, he was the Aussie-Asian guy taking orders - no relation to me, haha). Anyhoo, we ate our food, realised there was too much and asked our waiter to pack up our salad to takeaway - again, no problem. 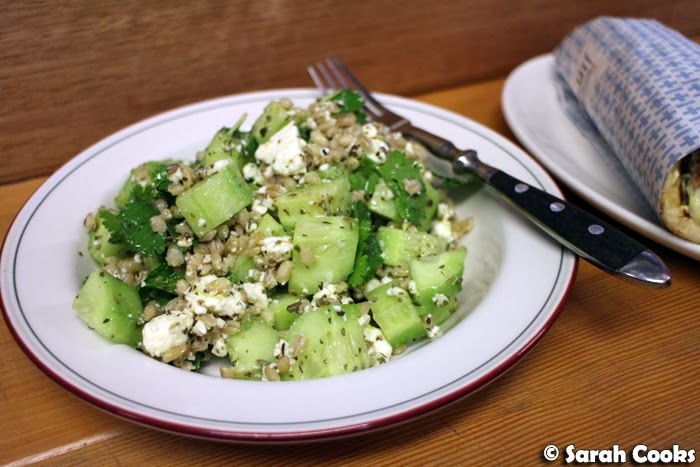 Less exciting than carb-on-carb action but still delicious, was the village salad we ordered, with its refreshing mix of cucumber, feta, barley, fresh coriander and dried oregano. Like I said above, we couldn't finish the salad - the souvas might look small but they sure are filling! - so we took it away and I had the rest of the salad it with dinner that night. 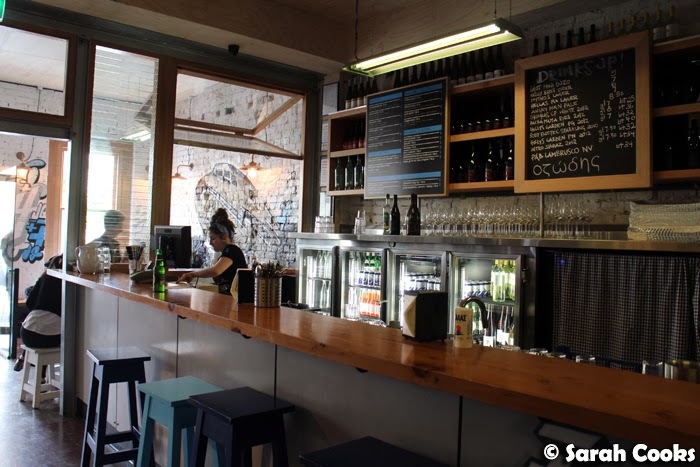 Have you visited Gazi's or Jimmy Grants? What did you think? Did you have a favourite dish? I just Greek food tonight and I am going to bed completely full of tarama and lovely halloumi. The food looks really good at both places! Also... Gemini: Mexata, white wine, Greek mountain tea, honey, cucumber, mint & apple soda. Yes I want that I do. 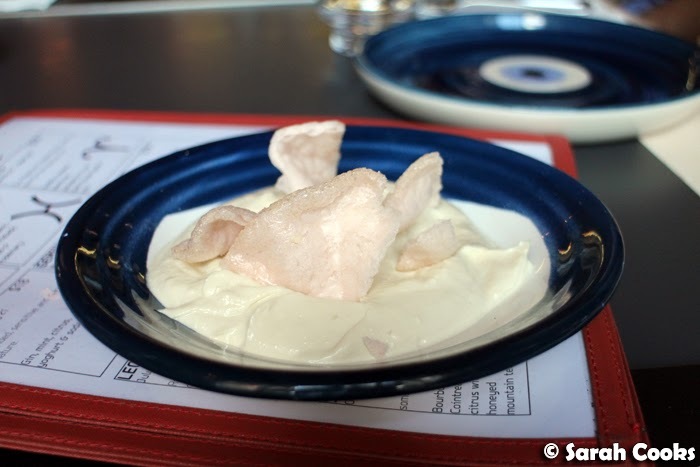 Who knew that taramasalata went with prawn crackers! 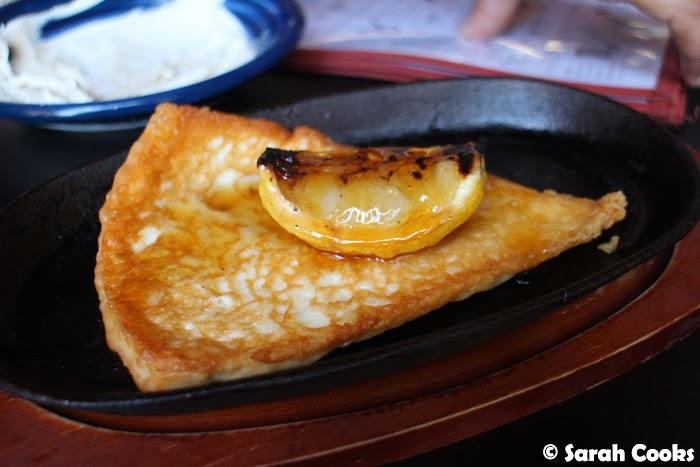 I'm lusting after that cheese saganaki - love grilled cheese with honey! Pity about the wait staff issue - it always takes a bit of time to get a new restaurant's staff up to speed! I haven't had Greek food for the longest time!